Really, I'll tell you a dream I had a few years ago that has something to do with the vanguardist painter Piet Mondrian. Why now? Why NOT? Piet Mondrian is the most famous member of the vanguardist movement/group of visual artists De Stijl. The famous part of his work is entirely made of red, blue, white and yellow rectangles separated by uniform black lines. They're the kind of paintings that "my 6 year old lil' cousin could do with his eyes closed," and yet he never does. 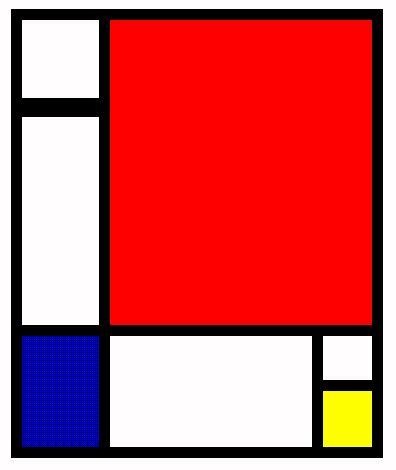 Mondrian's also known for leaving De Stijl when Theo van Doesburg, the second most famous member of the group, made the radical choice of including diagonal lines in his compositions. In 2008 or 2009 I was about to finish high school, and at some point I had to investigate about all this Mondrian stuff and whatnot. My first reaction was the common one: reject Mondrian's work as something ridiculous because its execution required no effort. But, as I already pointed out, there are activities that it's better not to judge by the difficulty of their execution. In fact, I find it hard to imagine any work that actually could be better to judge based on it. But never mind, the thing is, Mondrian's work began to increasingly captivate me the more I read about it. Is it good if a work is made in such a way that it seems hollow at first glance, and you can only care about it after reading what others have to say about it? Put that way, it may seem it's not. But that's just what happened to me. The idea is treating visual art as a way of… Well, I can't explain it fully, but it has to do with using forms and colors in their purest states to represent the purest and more essential principles of the universe. Say, most visual images require a certain contextualisation to be understood. If there's a person, what kind of person it is, what's it doing, what social meaning its activities have, those are all things we think when seeing an image that represents people. Mondrian's painting is something else. A dog could look at it and it would perceive the same forms we do. They're pure colored rectangles, and there's no other trick. No catch. Everything the work has is right there. There's no detail you might've missed. No secret meaning, nothing. Just the expression of a man who thinks beauty and geometry can become tools powerful enough to express the most basic way in which humans perceive the universe. Well, and I was investigating 'bout this dude's philosophy and work, and one day I had a dream. I was in some painter's studio, in his house. I'm not sure, but I think the guy was famous, in my dream's world. He wasn't Mondrian, but I now think he represented his philosophy. I could've been a journalist or an agent or a friend. For any reason, the painter was about to show me a painting he'd recently done. It was night time. I have like the vague memory that he maybe had it covered, and he pulled the cover. I suddenly saw what, I believe now, was the masterpiece Mondrian would've wanted to make. Someone had shown me a painting that exposed, in some way, the fundamental meaning of the world. It was a work of art, but it couldn't really be understood by mortals. It was an image, but it was evident that some of its colors exceeded the perceptive capacity of the human eye. It was an impossible object, or at least that's how it felt in the dream. Truth is, after waking up I forced myself to make the effort, and I understood I actually saw something that can be more or less described with words (after all, it was my dream, and it had to come from somewhere in my head). The composition's structure, as I understood it, was pretty simple: there was some kind of style gradient. The topmost part started with a style, say, simple, and the more I looked down, the style gradually changed, becoming something more abstract and overwhelming. The highest part was the easiest to perceive: it looked like a regular abstract painting, or maybe vaguely figurative. In any case, I don't remember how it looked, but it wasn't exceptional in any way. My eyes kept going down, uncovering a work that became more and more inhuman. I was somehow frightened. I could even hear some really high-pitch screams (frequent in my nightmares), that became unbearable if I tried to hurry and look down fast. The dream evidently wanted me to experience the painting little by little, top to bottom, calmly. I can't remember what I saw even lower. I know it reminded me of Lovecraft's writing: things composed according to a geometry different from the conventional one, with shapes that defy our common sense and provoke us discomfort, or even madness. As the screams became louder and louder, my neck was slowly letting my head point to the lower parts of the painting so I could keep contemplating more and more of this abomination of nature. And then at some point my neck simply stopped, like a selective crick completely preventing me from looking directly at the painting's bottom. Actually, like an object, unnoticeable to touch, right below my jaw, stopping my head from pointing anywhere lower than it was. So the end of the painting, the ultimate meaning of the universe, I could only see with the corner of the eye. What I saw (kind of) was a flat black surface, but with the strong feeling that there actually was something to see there. A flat black plane that seemed to consume everything nearby: in fact I'm under the impression that, had I looked directly at it, I wouldn't have seen the floor around it. Curiosity beat me, of course, so I tried very hard to look at it, and my neck didn't budge and the screaming became unbearable. That's when I woke up. The conclusion is I'm dead crazy! Or not, but you know, I wanted to share this 4 year old dream I since then tried several times to put down on words. Maybe it has some particular meaning? I've been told Sigmund Freud reads my blog, so it would be very nice of him to stop by and leave a comment with his opinion on the matter. And if not, any of you could try to make sense out of all this, couldn't you?